Biological Conflicts: two (territorial) marking conflicts. The conflict sequence is determined by gender, laterality, and hormone status. Brain and Organ Level: The corresponding brain relays are the control centers of the right ureter, right renal pelvis, right half of the bladder and urethra (left temporal lobe) and the left ureter, left renal pelvis, left half of the bladder and urethra (right temporal lobe), located opposite each other in the cerebral cortex. The Marking Constellation presents as compulsive urination. Only small amounts of urine though are produced. The purpose of the constant urge to urinate is to secure one’s “territory”. With an intense constellation, a person might pass urine every 20-30 minutes. Frequent urination, for example shortly before an exam or before going on a trip, is a natural stress reaction, because part of the fight-or-flight response is to eliminate waste as quickly as possible. If general stress can be excluded, a Marking Constellation has to be taken into consideration, particularly when the condition lasts over a certain period of time (“The problem started when I was about 11. I would pee up to 18 times a day and still felt like I had to pee.”). 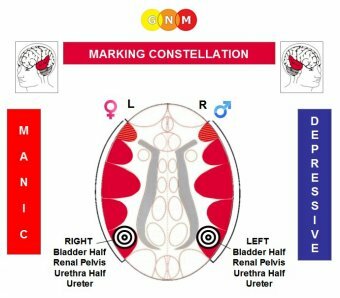 This brain scan of a left-handed male shows a Marking Constellation (view the GNM diagram) with the Hamer Foci in the control centers of the bladder, urethra, ureter, renal pelvis (right and left temporal lobes) caused by two territorial marking conflicts. Compulsive urinators are usually in a manic state. The reason why upon examination urologists are unable to attribute any organic causes is that the frequent urge to urinate occurs in the conflict-active phase, where there are no symptoms.